Winters in Missouri bring the potential for dangerous snow and ice storms, which can lead to hazardous driving conditions, the loss of heat and electricity and other risks to life and safety. Extended periods of sub- freezing temperatures can also pose hazards. The best way to prepare is to plan ahead and follow local weather forecasts and news reports. Also, think about the winter hazards discussed here. When it’s snowing or a major snow storm is in the forecast, there’s nothing more important for your safety and the safety or others than the decisions you make about driving. Avoiding a non-essential trip during a snow storm might not only prevent a traffic crash, it can allow road crews to clear roads more quickly and keep you from becoming stranded. Before hitting the road, decide whether the trip is really necessary. If you must drive when it’s snowing, here are some safety tips from the Missouri State Highway Patrol. Follow the local weather forecast and traffic reports. Plan travel during times when snow or icing are not in the forecast. Avoid unnecessary travel. 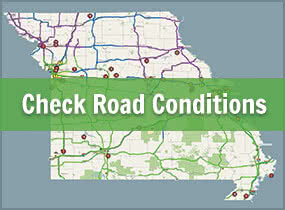 Check MoDOT’s Traveler Info Map for road conditions. Allow extra travel time and expect delays. Reduce speed and increase following distance. Drive based on conditions, NOT the posted speed limit. Focus 100 percent on driving because you have less control of your vehicle and less visibility. Use your headlights to increase your visibility to other drivers. Understand that bridges and overpasses often ice over sooner than other parts of the road. 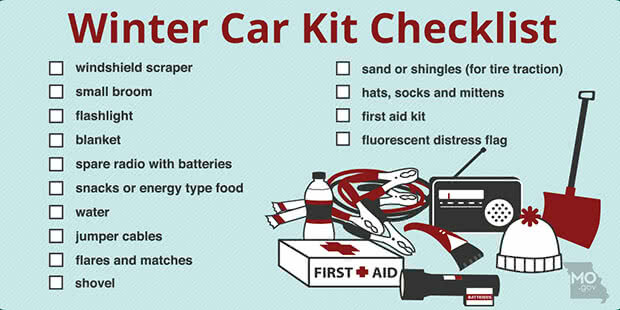 Place an ice scraper, battery booster cables, blankets, extra coats, gloves, water, non-perishable food, flashlight, and a bag of sand or cat litter in your trunk. Keep you gas tank at least half full. Travel with a fully charged cell phone. Park your vehicle before calling if you need help. *55 on a cellular phone connects you to the closest Missouri State Highway Patrol headquarters. Clear your vehicle’s windows completely before driving to ensure visibility. Never overreact or slam on the brakes. 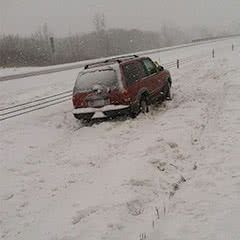 If you begin to slide, steer in the direction of the slide to regain control of the vehicle. Understand 4-wheel-drive vehicles may provide extra traction to get a vehicle moving in snow, but they are not better at braking or handling turns. 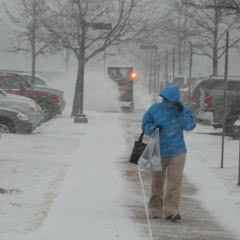 If you must travel in a snow storm, let others know about your route, destination and estimated time of arrival. If you become stranded in deep snow and are idling the engine to keep warm, be sure to keep the area around the tailpipe clear to avoid carbon monoxide poisoning inside the vehicle. Also, open a window slightly to let in fresh air. Tie a brightly colored cloth to the antenna as a signal to rescuers. Move anything you need from the trunk into the passenger area. Wrap your entire body, including your head, in extra clothing or blankets. Stay awake. 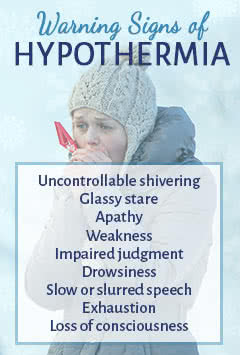 You will be less vulnerable to cold-related health problems. Run the motor (and heater) for about 10 minutes per hour, opening one window slightly to let in air. Make sure that snow is not blocking the exhaust pipe—this will reduce the risk of carbon monoxide poisoning. As you sit, keep moving your arms and legs to improve your circulation and stay warmer. Do not eat unmelted snow because it will lower your body temperature. Huddle with other people for warmth. The loss of power and heat for extended periods during a winter storm can create potential safety risks in your home. As families prepare to use generators and alternate heat sources to keep warm, it is essential that they are aware of the risks and hazards to ensure personal safety. If you lose heat to your home, temporarily close off less essential rooms and remain in one area of the residence. Keep warm by wearing several layers of clothing, gloves and a wool hat. Eat regularly and drink ample fluids, but avoid caffeine and alcohol. Flashlights and battery-powered lighting should be kept in the home and ready to use during a power outage. NEVER use candles as a light source. Generators should never be operated indoors and must be well vented to prevent fumes from entering a home. When using kerosene heaters maintain ventilation to avoid a build-up of toxic fumes. Refuel kerosene heaters outside and keep them at least three feet from flammable objects. If the pipes freeze, remove any insulation or layers of newspapers and wrap pipes in rags. Completely open all faucets and pour hot water over the pipes, starting where they were most exposed to the cold (or where the cold was most likely to penetrate). Whenever an ice storm or some other weather event has the potential to knock out power, charge your family’s cell phones to make sure you’ll have a way to communicate and get information if power is lost. Learn more about safety during power outages. Extended exposure to extremely cold temperatures, particularly if there are high winds, can present serious health hazards. During bitter cold temperatures it’s important to make trips outdoors as brief as possible and to remember these safety tips. Begin by dressing correctly for the cold. Several layers of loose-fitting clothing is a good way to start. Then remember the following: a hat; a scarf or knit mask to cover your face and mouth; sleeves that are snug at the wrist; mittens, which are warmer than gloves; and a water-resistant coat and boots. An outer layer that is tightly woven, preferably wind resistant, will reduce body-heat loss caused by wind. Wool, silk, or polypropylene inner layers of clothing hold more body heat than cotton. Stay dry—wet clothing chills the body rapidly. Excess perspiration will increase heat loss, so remove extra layers of clothing whenever you feel too warm. Do not ignore shivering. It’s an important first sign that the body is losing heat. Persistent shivering is a signal to return indoors. Frostbite is an injury to the body that is caused by freezing. Frostbite causes a loss of feeling and color in affected areas. It most often affects the nose, ears, cheeks, chin, fingers, or toes. Frostbite can permanently damage the body. The risk of frostbite is increased in people with reduced blood circulation and among people who are not dressed properly for extremely cold temperatures. Check with your doctor. Because shoveling can place high stress on the heart, speak with your physician first. If you have a medical condition or do not exercise regularly, consider hiring someone to remove the snow. Dress appropriately. Light, layered, water-repellent clothing provides both ventilation and insulation. It is also important to wear the appropriate head coverings, as well as mittens or gloves and thick, warm socks. Avoid falls by wearing shoes or boots that have slip-resistant soles. Take a break if you feel yourself getting too hot or too cold. 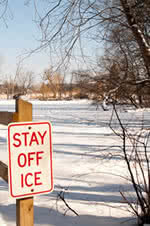 Watch for ice patches and uneven surfaces. Make sure that your hat or scarf does not block your vision. Be aware of your surroundings and alert for snow plows if you go into the street to dig out a vehicle. When possible, push the snow instead of lifting it. If you must lift, take small amounts of snow, and lift it with your legs: Squat with your legs apart, knees bent and back straight. Lift by straightening your legs, without bending at the waist. Then walk to where you want to dump the snow; holding a shovelful of snow with your arms outstretched puts too much weight on your spine. Do not throw the snow over your shoulder or to the side. This requires a twisting motion that stresses your back. Use a shovel that is comfortable for your height and strength. Do not use a shovel that is too heavy or too long for you. Consider buying a shovel that is specially designed to prevent too much stooping. Space your hands on the tool grip to increase your leverage. What may appear to be frozen over lakes or ponds can be inviting spots for ice skaters and children who would like to explore during Missouri’s winter months. Even in bitter cold temperatures, ice conditions on bodies of water can be extremely uncertain. The only guaranteed safe skating ice is at a skating rink. Ice found on natural bodies of water raises the risk of danger due to natural variables. There is no way to judge the strength and safety of ice by looking at it or by the temperature of the day. Fluctuating temperatures, exposure to sunlight and other factors affect the consistency of the ice. It can be a several inches thick in one spot and only an inch thick 10 feet away. Be especially wary of ice covered with snow. Snow can hide cracks and weaknesses in open ice. Parents should educate their children about the danger of going out onto a frozen body of water, including never following a friend or a pet into these potential danger zones.